With the short frost gone and warmer temperatures back in swing my tomato plants are uncovered again and ready to keep producing. There are several tomatoes still on the vine and although there was a slight bit of damage on some of the leaves for the most part the plants I was able to cover are doing great. The parsley too seems to have grown significantly. Compared with the one on the outside it's almost twice as big. No worries for at least a week and hopefully more. I left the stones out there for future use and folded the sheet up as well. Made a protective cover for my tomato plants. I actually do have a greenhouse but these plants are in the ground and well established. Tonight is supposed to get into the mid to low 20's, no way they would survive without this. What I did was get a medium thick sheet and put in stakes to support it over the plants. Sure some of the plants are hitting some of the sheet but for the most part they are pretty safe. The stems are hardier than the leaves anyway and with the warmth of the light in there they should be enough, with the small area, to keep warm overnight. I weighed the sides down with large concrete blocks. Most of them took both hands to pick up and place carefully. There is also a parsley plant in there with them. It;s supposed to freeze again Sunday through Tuesday next week so I will probably leave the sheet on until Wednesday and turn the light off during the day as long as it isn't supposed to be too cold during the day. I used some of our parsley last week in my gumbo. Loved it! Still have a few bowls left over in the freezer, one of the few really good freezer foods. Another of which is the muffins we made, fennel, fig, and chocolate. We made a lot of them about two years ago and I popped one out yesterday to thaw for a couple hours. Almost just like we had made them that day. The tomato plants made it through a little freezing weather but tonight is going to be below 30. I'm going to have to do something before night falls to keep them from dying overnight. I plan to pick the peppers and let the bush go. We already have more peppers than we will use this winter and have some still in the freezer from last year. I was really hoping to have a longer fall season before the temperatures froze. It's only supposed to be for a short time but that will be plenty to kill off my tomatoes if I can't get them protected better than last year. That won't stop me from trying at though. This year I plan to put in supports and weigh it down with some fairly heavy blocks. It isn't supposed to rain much so as long as I put it in well I also plan to put a light in with the plants for a little warmth, propped up off the ground a bit of course. The saffron fortunately loves this kind of weather and will keep sprouting. 14 counted so far and hoping for at least 20 if not more. Eventually I hope to have hundreds of bulbs springing up each season. That would be enough to use more than once or twice, depending on the recipe. After this week it's supposed to pop back up a little and be good growing weather again. Carrots should be planted this week too, probably mid week when I get a little time to work on the garden again. First sign of saffron this year. I checked it a couple weeks ago digging down about a half inch and there were no signs of anything at the time. Just shows what a little cooler weather can do. I'm now certain what kind of saffron I have, fall saffron. It hasn't shown back up in the spring. Of course the flowers haven't shown up yet but they are sure to follow and bring a nice bit of color to the garden. Apple trees are really easy to grow from seed. I've grown a few of them so far and usually just let them die off after a while since I don't have anywhere to really grow a full size tree. This little sprout came up over the weekend and needs to be put in sunny area of the office so it can acclimate a little more before being put outside. I can probably find somewhere this guy can go, whether it's somewhere on a vacant lot or an out of the way spot where it won't drop apples on anyone's car, not the best thing for a car. Unfortunately I won't be able to tell what kind of apple tree this will be. Most people don't think about it but usually the seeds of an apple will not produce the same kind of apple the seed came from. Often the trees will be grown among other apple tree varieties that are better pollinators, usually crabapple, so that the crop will be larger than if they were just by themselves. This is why I didn't even bother to label what kind of apple it came from, just that it was an apple. Since I'm not really picky about my apples as far as variety it won't matter anyway. Also it takes several years for an apple tree to produce. It's taken all summer but the strawberry plants are finally starting to feel at home. Some of them didn't make it but with the heat, even though it has been a mild summer, took half of the plants. The rest seem to be liking the location we selected and are starting to get bigger. Hopefully we'll have a few berries before the summer is over. Our trip down south just reminded me of how much I wish we had more rain. We were caught in a sprinkle, not a downpour or a barely nothing few drops. It came down softly and cooled things off a little. Of course after that the sun came back out and turned it all to humidity you could feel. Kind of like when you have a hot shower, you just stepped out, and the mirror is fogged up so thick you think it's just part of the wall. The rain this summer has been keeping our July nice and cool this year. It's still been a little too warm for some of my tomato plants to produce well but they're looking healthy and I have hopes for a nice fall tomato crop. They say it probably hit 100 degrees for a short bit one day so far but I don't think it quite made it where I was so I'm refusing to count it. The rain and warm weather has gotten my cucumbers to produce really well this year. We've eaten several of them so far and there are still more growing. Likewise the pepper plants are loving the weather. They would grow in hotter weather too but with the rain and nice temperatures there are plenty of peppers for making tasty meals. For some reason the zucchini isn't doing so well though. They made some fruit and then began to die back. I thought people always talked about the plentiful zucchini but maybe I need to redo the soil. There's always next year. The potatoes made little bitty potatoes after the tops died back. If there's anything else down there I haven't found it. It's possible that it's really deep though and I want to wait to dig any deeper so as not to disturb any neighboring plants. There are still onions in the ground nearby as well as some herbs. I was reading in the paper and there was an article about the hassle of making bread. It talked about how we don't know how to do the simple things anymore and instead rely on store bought loaves that really don't give you the same satisfaction as if you got them fresh. In this article they also gave a recipe for what they called the easiest bread ever. Sure they made it look all fancy and plugged specialized equipment that no one really ever needs to even know exists, but the for got to loop back to the real problem we're facing. It takes time to make bread and they gave one of the worst recipes I can imagine to start with. They said to use yeast, and yes they recommended quick rise yeast, but they insisted that you don't have to kneed it and that it takes three hours to rise. This is the part that bugged me. At this point you might as well have thrown the ingredients into a bread machine or gone down to the store and gotten some of their bakery items. You'd have the same experience. To make a good loaf of bread, and really feel more a part of the process, you have to get your hands dirty. Knead the crap out of that dough! This isn't just a way to mix the dough. First off this really makes you appreciate the bread and what goes into it. Second it actually makes the bread rise better. Your body heat gives the yeast a better environment to thrive and thus makes it rise quicker and better. Another thing they didn't seem to want to do, and I can understand that there are a lot of people out there who might agree, is add sugar to the ingredients. We're not talking about a cup of sugar or even a quarter cup. All you need is a teaspoon or so to feed the yeast. This will wake those buggers up and help them multiply. Even with quick acting yeast I would add sugar. This doesn't affect the taste of the bread since the yeast eats nearly all of it up during the process. As far as the tools you need, you just need a bowl, some measuring cups and spoons, and a loaf pan or two. You might even decided to make it a round loaf which just needs a flat pan to bake on. Get used to making bread first and if you decide later you want to get fancy then go explore the world of breads and see which kinds you like. In general they are easy to make and will make you feel accomplished. 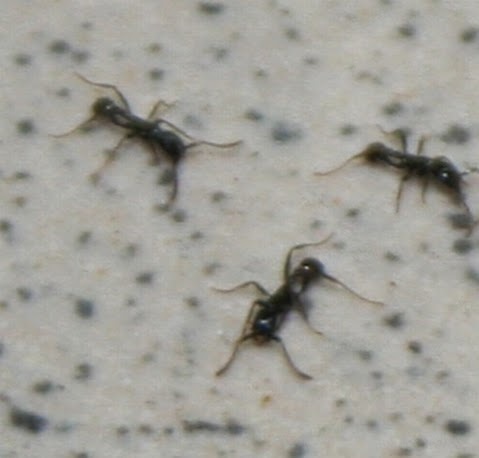 Sometimes, even three stories up, you run across the problem of ants. Ants of course live in dirt and when you have many plants sometimes they get the idea that it would make a nice home. Apart from removing the dirt you have few options. What I recommend is taking the plant out and soaking the dirt to drive the ants out. After you are sure the ants are out and have fled for their lives you can then let the water drain out and put it back where it came from. To prevent ants from returning you need to try to find out what they've been eating that makes the dirt such a convenient home. In my office's case it seems to be crumbs left over from having food in the conference room a little too often. Once the food source is removed all you have left to do is a little preventative spraying and you should be fine. If they return then something else is wrong. Maybe the floor under or over you is providing plenty of food for everyone and the problem you're having may just be run over from theirs. In that case you would need to discuss this with your neighbors. The garden is growing well. Here are a few of the picks from yesterday. We already ate one of the zucchini and a few of the cherry tomatoes. The peppers we have planned for a curry although we haven't decided which kind to make yet. It will almost definitely involve potatoes though since, as far as we can tell, potatoes seem to go well in every curry dish. There are plenty more tomatoes out there as well as some more forming zucchini and peppers. There is also some squash that should be ready soon and hopefully some cucumber. I planted some green onion from seed recently and it's taking off well enough. It isn't huge but it's already a few inches tall. Quicker than I expected. It's supposed to continue raining for some time this week which hopefully won't interfere too much with the outdoor activities we have planned. The percent isn't too high so maybe it will be mostly morning showers. We can deal with that. The cacao trees are growing well. The leaf on the right is the topmost and biggest leaf on the plant. It is about fifty percent bigger than the other leaves on the plant. There are a total of seven leaves now, six on the main trunk of the tree and one on a side branch. This is of course the one in the window of the main conference room. The other trees are still smaller than this one even though they are in much larger pots with more room for putting down roots. They also have varying amounts of light. The main plant still has pretty much all day sun through UV protective glass with a small break in the middle of the day while. Pot two has two trees with afternoon sun. It also has another tropical office plant and a pineapple plant growing in it. The trees have about five leaves each and have grown a couple inches in height since the last post. Pot three has three trees with only ambient outside light. It's been slow growing but still steady. The smallest one only has three leaves still but it's really starting to grow faster. I might need to transplant these to separate pots so they can have a better chance to grow well. It shouldn't be to hard at this point but may get harder to do if they get much farther along. When I added dirt to the main plant it's roots were coming along but it was no where near root bound. I could only barely see the roots at the edges of the cup. In a couple more weeks I will be transplanting it into a real pot although probably not it's final pot. That will take some time before it can have enough presence in a room to merit it. It is in an office after all. The zucchini plant has been growing fairly well. So far there has only been one female flower to speak of. When I saw it open one morning I made sure it got pollinated and voila it started to grow. now if only it would make more female flowers we could have a nice side dish with dinner, or maybe a baked zucchini dish. At any rate, only one will not do for anything but a quick snack, but oh what a snack that would be. Tomatoes are doing well so far this year. These first ones are large cherry tomatoes. 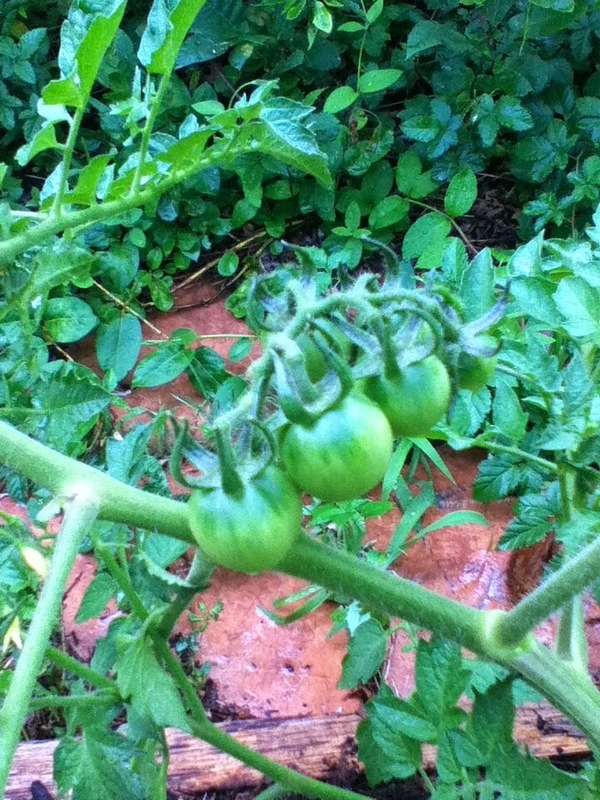 There are several plants and three of them so far have tomatoes developing to some degree or another. These are the largest of the group and were the first ones to make an appearance in the garden. That is of course not counting the other vegetables. The next tomato here is an unknown variety and was the runt of a litter. I really didn't expect it to live where I put it but it surprised me and took off better than any of the other plants planted so far. I guess the pot it's sitting in was just the thing it wanted. Although the tomato shown started well past the large cherry tomatoes, it is at least twice the size of one of them. It is also the only pot on the side of the house that currently has plants I intended to plant there. There are a couple more but they only have weeds. In with this plant there are also other tomato plants as well as an onion plant and what I believe is either a pumpkin or other squash type vining plant. It doesn't seem to mind the company and it has kept any other weeds from growing in the pot with it. There are also several other newly forming tomatoes on this plant. Although I'm not expecting a bumper crop, this is already turning out to be a much better start to a year than last year. The cacao trees seem to like the office environment pretty well. Here is the largest and only tree not planted in an actual pot. I transplanted two almost just like it from solo cups to pots and the roots were already starting to wrap around the bottom a week ago. They really like it near windows where they can get a decent amount of light but not necessarily full sun. This little guy sits by a south facing window in a "V" shape. It gets morning and afternoon sun through a window that has pretty good UV protection, keeps the office cooler in the summer. At mid day it's in the shadow of the support for the windows as if it's hiding behind another tree which is just about perfect for him. The leaves were initially a very thin and translucent which worried me for a little while but as they matured they took on this nice healthy green look. The tops look like they might start to produce more leaves soon but so far that's just a guess. There are also two stubs on the side under the leaves that might also be possibilities for leaves/branches or may be the beginnings of the flower pads that will hopefully produce the lovely cacao pods I so hope will produce before too long. Either way they will have to be repotted well before that happens. I'm thinking a 5-10 gallon pot should suffice, especially if I keep them pruned to stay inside with max ceiling height of 8 feet. For more progress see the update post. Quite a few of the cacao seeds have sprouted and are doing well. Most of the healthier ones started in solo cups, go figure. I have several in larger pots and they're putting down some good roots. Hopefully in a few years I can get some fresh cacao pods. It will have to keep them pretty short though since they can get upwards of 25 feet high or more. They're understory trees though and thus they will do well indoors in indirect light. The big problem will be is if we keep them inside the house and the cats want to eat the leaves. Not sure how this might affect them but they will chew on anything. The reason I really want fresh pods is because I tried getting them shipped in but by the time they got here the pulp was already drying out and not nearly as juicy as I had hoped. I've had a fresh pod before and the pulp was dripping rather than just moist. It looked like the outer layer had been absorbing the moisture and getting softer. Not sure but this is probably it's natural way of decomposing and spreading it's seeds. My lovely cacao pods came Saturday. They range from about 8" to 5" long. Although this picture really doesn't do them justice, the small yellow pod is much more yellow than the other two. We plan to have some folks over to taste the wonderful pulp and at the same time have a seed planting / roasting party. Freshly roasted cocoa beans I'm sure will smell wonderful. These pods were purchased from the more and more famous Montoso Gardens, at least among the chocolate connoisseurs here in the states. These are not the GMO pods that are now starting to pervade the cacao markets but naturally grown and harvested pods historically grown in Puerto Rico. If you've never tasted the pulp from a fresh pod you should either take a trip out to the Caribbean or at least order a few pods for yourself. They are fully licensed to ship to the main land. The onion patch is growing great. I watered the first few days and since then the rain has taken care of keeping it watered for me. We've also got a seed vault off of Amazon which we're planning on starting seeds from and planting tomorrow. We're putting up shelves for the starters and I have finally taken down the pecan tree in the back yard which was threatening to fall on either the house or the power lines eventually. Neither of these options seemed like a good idea to me and so I spent the better part of a day felling it and three evenings after work cutting it into pieces. We will now have plenty of sunshine peering through where the pecan tree used to be. I also plan to have the mimosa tree cut to the ground in the next week or so. I cut it, mostly, down a couple years ago for a similar reason but it's putting forth shoots from all over and just doesn't want to die. Also in the near future I'm looking into putting in a green house for even more plant loving fun. One fellow had the good idea of putting a Jacuzzi in the greenhouse so it can be enjoyed year round. Not a bad plan.